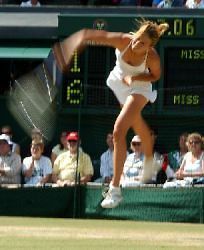 A catalogue of variables can influence the outcome of a tennis match. However, with most playing only minor roles, this section looks in detail at the key variables that must be considered, and how they can be analysed to find value. This has a bearing on the outcome of all matches and consequently bookmakers' match odds are largely a reflection of the difference in ability of the two players. Ability can be measured in many ways, although ratings are probably the most commonly used method. In the men's game, the ATP use two systems to rate players based on their performances on the tour which punters can therefore use to quickly assess the respective abilities of the two players contesting a match. The Entry Points system takes into account players' displays over a rolling 52-week calendar, with more weight given to their displays in Grand Slams and Masters Series events. Players are ranked depending on the number of points they have amassed and the ATP deploys these rankings to iron out issues such as which players will be granted automatic places in events and who will be seeded. This system is also used by the WTA to rank the top women's tennis players. The Champions Race system is based on performances in that year. Players start at zero in January and accumulate points throughout that season. Both systems have their strengths and weaknesses. The Entry Points system takes into account the results of players over a longer time frame, so is a more reliable indicator of ability. The Champions Race is largely a form-related rating, especially in the early part of the year when players have appeared in few tournaments. Some of the other criteria commonly used to assess a player's ability are how many career titles they have won or the number of Grand Slam titles they have captured. Winning tennis matches instils confidence and generates rhythm in players' games and this can offset a gulf in ability between two adversaries. Every season players of differing abilities are able to string together lengthy winning sequences, while others will suffer long losing runs. Form is much harder to quantify than ability and therefore bookmakers have problems factoring its influence into their prices. Statistics are commonly used to approximate form, although watching matches can also provide visual clues to a player's current well-being. Win-loss records, games difference and players' positions in the Champions Race are just a few examples of form-related statistics, but, with so many available, it's best to be selective and analyse just one or two. A player lacking fitness or carrying an injury will not be able to produce his A-game so this will greatly reduce his chances of winning. It can therefore pay to oppose players who you know are suffering from an ailment or are short of match fitness. However, obtaining up-to-date injury news can be problematic for punters as players are coy about the state of their fitness, because revealing that they are not in supreme condition can hand an advantage to their opponents. Visual clues such as strapping are obvious signs that a player is carrying an injury, while the wearing of cycling shorts can be indicative of a thigh or hamstring problem. Statistical evidence can also yield information. Lower serving speeds than normal can mean a player has a shoulder or rib injury, while a sudden increase in unforced errors can be an indication of fatigue. Stamina is more important in energy-sapping clay court tennis when the rallies are long and arduous, and also in tournaments played at altitude where the lower levels of oxygen in the atmosphere force players' cardiovascular systems to work much harder.